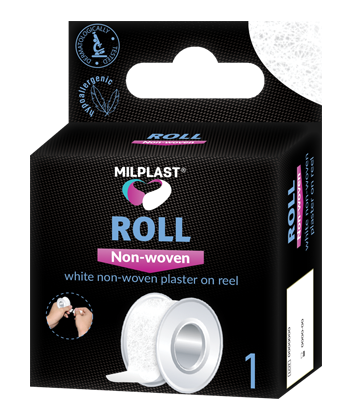 Non-woven plasters Milplast ROLL (Non-woven) is developed specialy for fixing bandages, catheters, probes, compresses, tampons. Due to the fact that the patch is released in the form of a cutting strip, it is easy to cut into pieces of the required length. Thanks to the hypoallergenic non-woven base from which the adhesive is made, it is excellent for use in the most sensitive areas of the skin. Suitable for people prone to allergic reactions. It can be easily and without any pain removed, leaves no traces. The material of plaster allows the skin to breathe and is easily and painlessly can be removed without leaving traces. Easily torn without scissors. 1. Remove contaminations and water from the wound and surrounding skin. 2. Take plaster out of the box and cut the required length. 3. Fixe the plaster on the damaged area. For external use only! Do not leave plaster on the skin over 24 hours. Hypoallergenicity of materials reduces probability of hypersensitivity reactions, but does not exclude their occurrence.